Providence, RI (11/13/2011): The Rhode Island Reds Heritage Society and the Rhode Island Convention Center Authority unveiled the newly completed Rhode Island Reds exhibit during a dedication ceremony and press conference Sunday, November 13th, 2011 at its new home, the Dunkin’ Donuts Center. The event was attended by about 200 guests, including former Reds players and family and members of the Reds Heritage Society. The event was hosted by James Bennett, chairman of the Rhode Island Convention Center Authority and son of the Reds’ longest-serving goaltender, Harvey Bennett. Guest speakers included Rick Scherza, son of Reds legend Chuck Scherza; Hugh Toppazzini, son of the late “Player of the Century, Zellio Toppazzini; Shirley Toppazzini, widow of Zellio; and Clegg. The exhibit consists of three, three-sided kiosks, each 94 inches tall, manufactured by Sonalysts Inc. of Waterford, Conn., and Middletown, R.I. The first kiosk, named “The Arena,” commemorates the Rhode Island Auditorium, home to the Rhode Island Reds for half a century. The front panel describes the history of the Rhode Island Reds in the auditorium and incorporates a display case for artifacts including a jersey, programs, skates and photos. One side panel describes how the Auditorium was the hub of Rhode Island entertainment, hosting everything from concerts to rodeos to trade shows. The other side panel recognizes the contributions of Louis A.R. Pieri and George M. Sage, former owners of the Reds and the auditorium. The kiosk was unveiled by Louis A. Pieri and Lucille Pieri Martin and Barbara and Anne Sage. The second kiosk, “When the Reds Ruled the Roost,” outlines the history of the Rhode Island Reds. A screen integrated into the front panel shows an 11:11 video except of “When the Reds Ruled the Roost,” the Rhode Island Heritage Society’s Emmy Award-winning video history of the Reds. 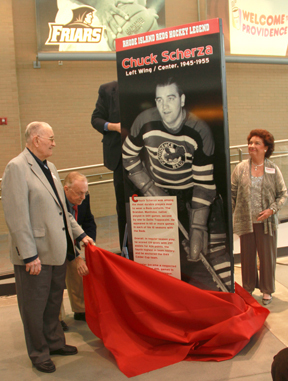 The side panels feature biographies and larger-than-life images of Zellio Toppazzini, the Reds “Player of the Century,” and Chuck Scherza, the Reds star and stalwart who is second only to Topper in the number of games he played in a Reds uniform. The kiosk was unveiled by Shirley Toppazzini and Chuck Scherza. The third kiosk is called “The Goalies.” The Rhode Island Reds produced stars at every position, but none more so than in the net. This kiosk honors the men who served as Reds netminders the longest, and those who went on to fame: Harvey Bennett, Marcel Paille, Mike Karakas, Gil Mayer, Ross Brooks, Johnny Bower, Eddie Giacomin, Frank Brimsek, Gump Worsley and Harry Lumley. The front panel incorporates a display case for artifacts including Bower’s leg pads and Mayer’s masks, the first worn in the American Hockey League. The kiosk was unveiled by James Bennett and Gil Mayer. After the unveiling, guests were treated to refreshments and seats at the Providence Bruins-Boston Bruins alumni game courtesy of Rhode Island's AHL affiliate, the Providence Bruins. Restaurant Space was generously donated by James Bennett and the R. I. Convention Center Authority. Reds legend Chuck Scherza and Shirley Toppazzini, widow of Reds great Zellio Toppazzini, unveil one of the kiosks at the Dunk. For video of the event, including Bruins alumni congratulating Topper on his election to the Hall of Fame, click here. Video created bu Hugh Toppazzini.